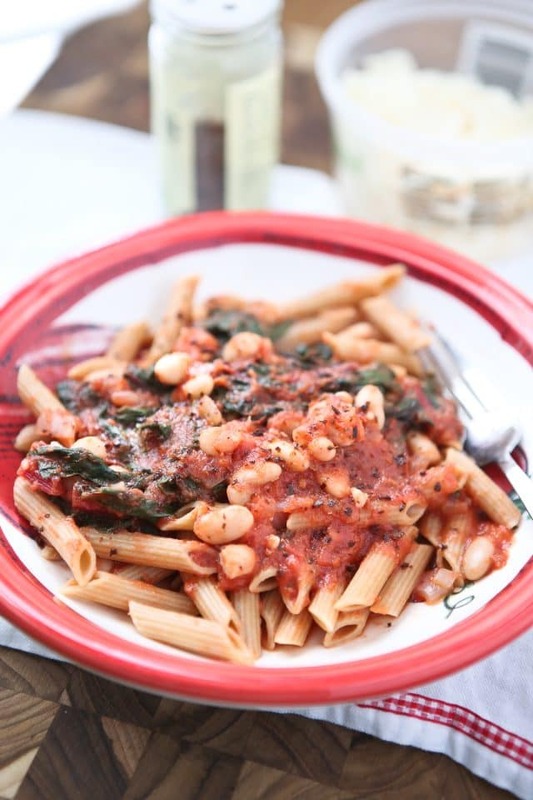 Swiss Chard with White Beans in Tomato Sauce over Pasta – whole wheat pasta, greens and beans make this dish a hearty vegetarian pasta meal! This recipe was created in partnership with Bush’s Beans. You all know by now, I like my greens. Spinach, kale, chard…I’ll take it all. Especially this time of year when I find myself googling ‘how to boost immune systems in children’, when I already know the answer. In case you weren’t sure, greens definitely play a part in the good nutrition part of boosting immune systems – and apparently we need all the help we can get lately. The struggle is real when it comes to including as many greens as possible into my family’s diet. I like to use spinach leaves in place of lettuce in salad and try to include it in pasta or soup as much as possible (see this Pesto Pasta with Turkey and Kale and Chicken Gnocchi Soup). 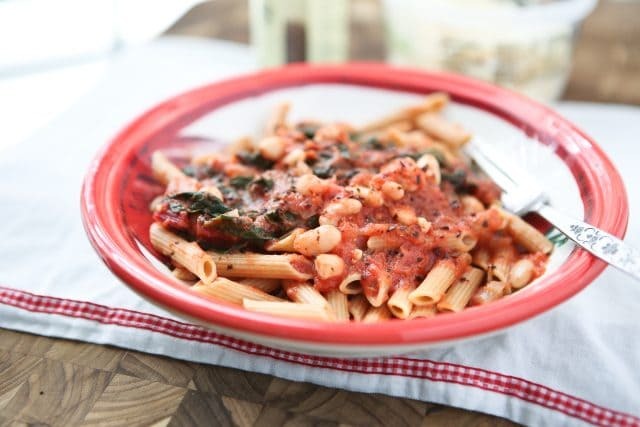 This meatless pasta dish made with whole wheat pasta, greens and Bush’s Great Northern Beans is another way to get some good nutrition on the table – and quick! 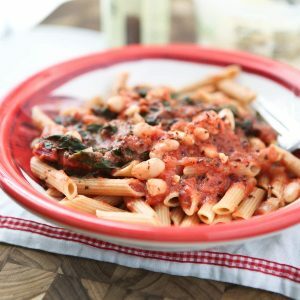 With beans, pasta and canned crushed tomatoes being pantry staples, this is such a great base pasta recipe to add any fresh vegetable too. 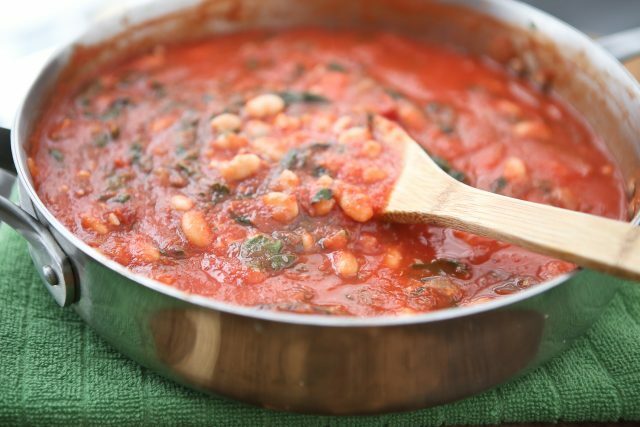 Swiss chard with beans sauteed in tomato sauce are the perfect pairing and a great way to introduce a new leafy green and include beans to your diet. If your family needs some meat to balance out the meal, add some roasted or grilled Italian chicken or turkey sausage to each dish. With or without the sausage, this is the kind of meal that is exactly what I need when I’m craving something hearty and healthy. While pasta is cooking, in a large saute pan, heat olive oil and begin to saute onion and garlic. Add a pinch of salt and pepper. Cook onions until soft, about 3-4 minutes. Add chard to pan and saute until soft and wilted, about 8-10 minutes. Add can of tomato sauce with additional water to pan. Stir and bring to a simmer. Add can of white beans to sauce and cook for about 2-3 more minutes until sauce is slightly thick and flavors have come together. Drain pasta and drizzle with a little olive oil. Serve sauce over pasta with red pepper flakes and parmesan cheese. This recipe was created in partnership with Bush’s Beans. Thank you for supporting the brands that support Aggie’s Kitchen. Hello, lover. Get in my mouth. Ew, that came out wrong. I totally get it Bev, I do. I love adding greens to anything that’s tomato based. Something about the acidity in the tomatoes that goes great with the bitterness of the greens. you are so right! it really is such a great combo. I made red beans n rice tonight but instead of rice I had my beans over sauteed chard (obsessed) so it was lighter…the combo was amazing! Somehow beans, greens, and tomatoes just WORK. We’re on the same wavelength – I did something similar in a soup recently. great minds is right! love it!! Hope you and baby are doing well!! Hi Aggie! It is cold, wet, and raw here in New England! I am SO making this for our dinner this evening! We’ve got the fires going in the kitchen woodstove and the living room … cozy house, cozy tummies coming right up! Thanks for posting this recipe! So glad I dropped in today! Nice healthy, comforting ingredients, Aggie. 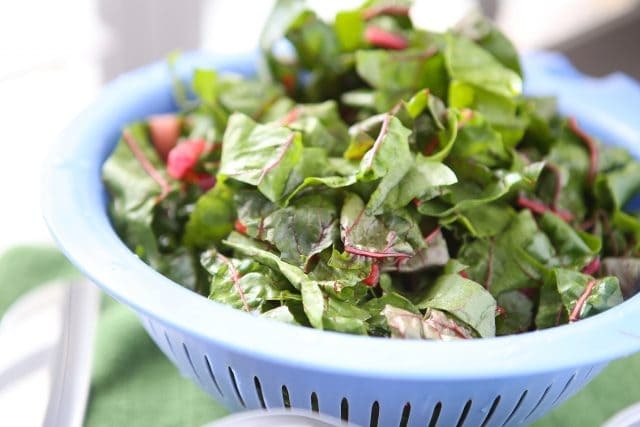 We’re crazy about swiss chard too! Mmmm…. I LOVE all these ingredients! Oh, love these ingredients. Going to share with my sister, too! Thanks Aggie! Made this with chick peas and spaghetti squash as the “pasta”. Very excellent! That sounds delicious!! Thank you for letting me know! how do you know how big the serving size is. I never think to add beans to my pasta dishes. I totally need to start doing that! It looks delicious! You do easy and healthy well girlfriend! This is so my kinda dinner! This looks so hearty! I love white beans and swiss chard together! OH, Aggie, I love this so. So healthy, yet comforting. Such a perfect and well rounded pasta meal! I love chard and beans, totally making this. I absolutely love how healthy this is, Aggie! This is my kind of meal, Aggie! Packed with fiber, veggies and healthy protein – so much goodness on one plate. You always share the best beans recipes!! This is totally my kind of dinner. Like you, I love my greens. And I love my beans. 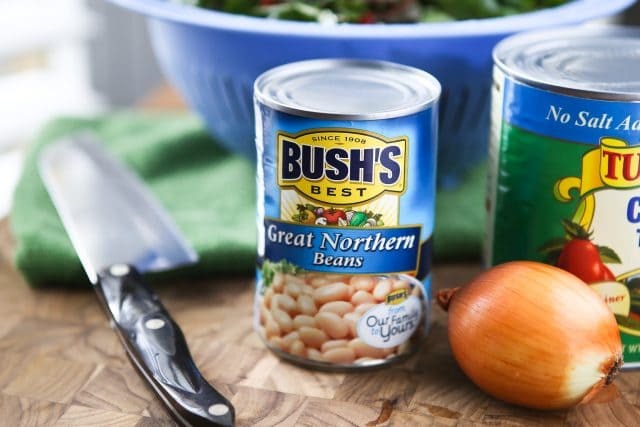 Bush beans are always always always in my cabinet!!! They’re the BEST!! I definitely like exactly how healthy and balanced this is. Such a best and well rounded pasta dish! I love chard as well as beans, absolutely making this.